MeshViewer is a robust tool used for fast preview of the exported geometry, animation and textures. It allows for converting loaded data into Unigine supported formats. 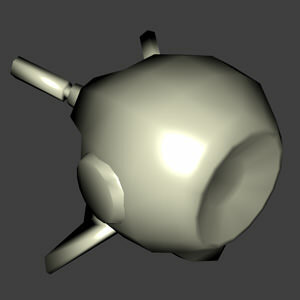 Besides that, it has a set of useful features to help artists in optimization of created models. 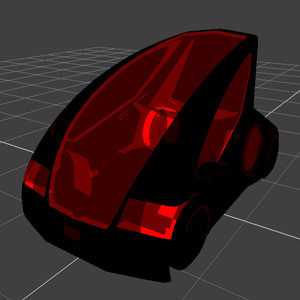 MeshViewer uses a simplified set of shaders to speed up the loading, so its primary purpose is a fast display and visual check of the data obtained from a 3D editor. Fast preview of models exported from a 3D editor (see supported formats). Convert geometry data from external file formats into a native Unigine mesh. Export animated meshes as a simple geometry. Check UV mapping and texturing of the model. 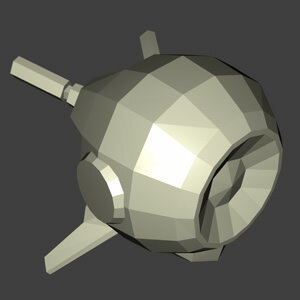 Try out tessellation and parallax mapping according to the loaded textures. Tangent space to light the model correctly. Manage model geometry: save a mesh without some of its surfaces, save selected surfaces of the model as separate meshes. Ensure efficient usage of vertex cache by a model at rendering time. Save the textured model as a project. After that, the set up model can be loaded in one click. Mesh - display a loaded mesh with applied textures in the viewport. TexCoord 0 - display the first UV set. TexCoord 1 - display the second UV set. 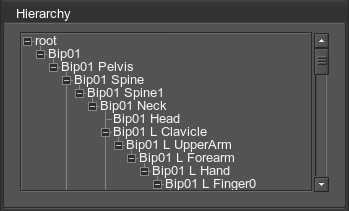 Bind pose - display a loaded mesh in the bind animation pose. The other poses, if exist, will be displayed in the drop-down list under the Bind pose option. 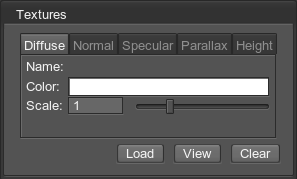 Autodesk 3ds Max flips axes automatically, so you don't need to enable this option. Flip tangent space orientation - flip the orientation of the tangent space for the correct model lighting. Vertex cache optimization - reorder an indexed triangle list for improved vertex cache utilization. When turned on, the model may take more time to load. Though you can load animation using this option, there is a special option, Load Anim, made for quick and convenient animation loading. You can also load the mesh by pressing Ctrl+O. Flip Y/Z axes and invert Y axis - load the animation with the proper orientation in Unigine coordinate system. Current animation only - save only the current animation with specified animation range. To save geometry without animation, use Export Mesh. If no surfaces are selected, the whole mesh (all non-hidden surfaces) will be saved. If one or several separate surfaces are selected (for multiple selection hold Shift or Ctrl), only specified geometry will be saved into the file. The same options as for loading are used for saving. Models that have third-party formats can be saved into the .mesh format only. Also note that if the Vertex cache optimization option was enabled when loading a mesh, there is no need to enable it again. Remember, however, that this optimization should be used on any step: either when the model is exported from 3D editor, loaded into MeshViewer or saved. Though you can save animation using this option, there is a special option, Save Anim, made for quick and convenient animation saving. 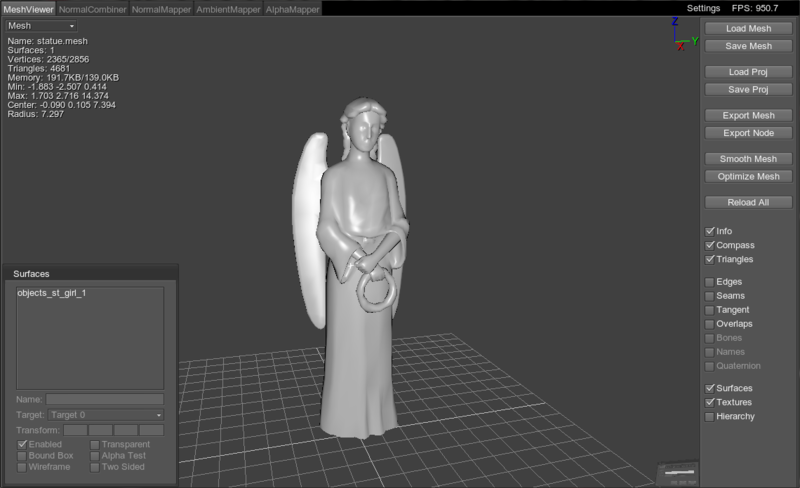 Load a saved MeshViewer project (.proj file), which contains a model, textures and all settings made for them. Save a mesh with all its settings as a project (into a .proj file). This file contains a path to the mesh file and settings made for mesh surfaces (textures, parameters and flags). After being saved, a mesh can be quickly loaded. Note that the project with the applied textures and surfaces cannot be exported to Unigine engine. MeshViewer is used for preview purposes only. If one or several separate surfaces are selected (by holding Shift or Ctrl), only they will be saved rather than the whole model. Animated model will be exported as a simple static geometry as it is displayed in the current animation frame. Parent Material - parent material for the material being exported. Material Prefix - prefix to the material being exported. Diffuse Texture - add a diffuse texture. Normal Texture - add a normal texture. Specular Texture - add a specular texture. Material Export - name of the material being exported. Node Export - name of the node being exported. Angle - a threshold angle for smoothing. If an angle between two polygons is smaller than the set threshold angle, they are smoothed. If it is unchecked, normals of all polygons are merged. The mesh will have no sharp edges — it will be all smooth. Unckecking Angle option is the same as setting threshold angle to 180 degrees. If the Angle is set to 0 degrees, no polygons are smoothed. Each polygon face will be shaded independently, resulting in a sharp and edgy appearance. The higher the angle (up to the maximum of 180 degrees), the more polygons are smoothed, as the angle between their faces is smaller then the threshold one. Flip Tangent - flipping the tangent space orientation. Seamless - cross-surface smoothing of a tangent space. Non-smoothed mesh. Angle = 0. Vertex cache - reorder the indexed triangles list for improved vertex cache utilization. Back to front - render mesh polygons in the back-to-front order (from peripheral to central polygons). For the difference between these rendering methods to be seen, enable the Overlaps option. Reload all resources (mesh and its textures). 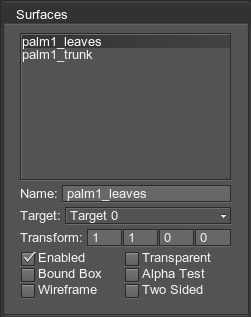 This option does not affect set up parameters for surfaces and textures. Name /Surface - name of the mesh/surface. Surfaces - number of surfaces. Vertices - number of coordinate/triangle vertices. Triangles - number of triangles. Memory - taken system/video memory space. Min and Max - coordinates of the minimum and maximum points of the axis-aligned bounding box. .
Center - bounding sphere center coordinates. Radius - bounding sphere radius. Enable a XYZ compass in the upper right corner of the viewport. Show the base grid plane, as well as triangles of the mesh (its selected surfaces) or a wireframe (if enabled). Show texture edges for the mesh (or its selected surfaces) in red. Show texture seams for the mesh (or its selected surfaces) in green. Show the tangent space at polygon vertices of the mesh (or its selected surfaces). 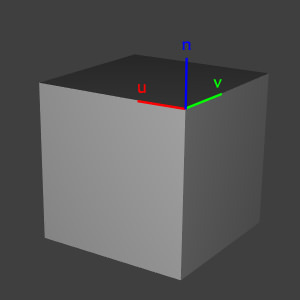 It represents texturing coordinates for face of each polygon with the triple of vectors: U, V and normal vector that is always perpendicular to the face itself. This option is useful for detecting tangent space discontinuities, which may cause lighting artifacts. In areas where adjacent polygons have a different tangent space, there will be an noticeable edge; in areas where tangent space is the same, there will be a smoothly curved surface. Show overlaps in UV coordinates in different shades of red. The more saturated is the color, the more overlaps there are in the given point. Show bones of the mesh. Show names of the bones. Use dual quaternions for the skinned mesh. When quaternions are used instead of simple matrices to describe rotation and position of vertices, it allows to reduce a twisting artifact between two bones, which is often seen at shoulder joints of characters. With dual quaternions character joints do not look deformed like a candy wrapper. Show a dialog window with a list of surfaces and their visualization parameters. List of the available surfaces. Multiple selection by holding Shift or Ctrl is supported. Name - edit the surface name. Target - choose the morph target in the drop-down list, if there are any. The first two fields set the scale factors to the X and Y axes respectively. The third and the fourth fields set the offset factor to the X and Y axes. The values should be non-integer to produce a visible offset. Enabled - enable the chosen surface. Bound Box - display the bounding box enclosing the surface. Wireframe - enable the wireframe view for the surface. This option is in effect only when Triangles are enabled as well. Transparent - enable surface transparency. Alpha Test - enable alpha testing for the applied material. Two Sided - use double-sided surface. Show a dialog window with texture settings for the selected surface. On the texture tab you can Load a new texture, View or Clear the loaded texture. If multiple surfaces are selected, these operations will be performed for all the textures. Color - edit the diffuse color component. Scale - edit the brightness of the diffuse color. Scale - edit the diffuse color scale. Specular tab for a specular map. Color - edit the specular color component. Low values for wider highlights. High values for pinpoint highlights. Parallax tab for a parallax map. This map can be created in the NormalMapper. The higher the value, the further the pixels will appear to be pressed into the surface. Height tab for a tessellation height map. This map can be created in the NormalMapper. The higher the value, the more refined the contour of the tessellated surface will be. The higher the value, the farther vertices are displaced and the more protruded the tessellated surface is. Show a dialog window with the animation hierarchy. Preview skinned animation is supported only for meshes containing animation. Simply click Play if animation is stored in one .mesh file together with a mesh in a bind pose. Click Load Mesh and select.mesh file with a bind pose. Click Load Mesh again and select.anim file with animation data. Check Animation only at the bottom of the dialog window. Play the animation applied to the skinned mesh. From — the first frame to start animation playback from. To — the last frame to end the animation playback with. Fps — the speed of animation playback. Play — play the animation in a loop. To open the help window, containing the brief information about the tool and the list of hot keys, click Help at the bottom right corner of the MeshViewer window. You can also open the window by clicking F1. .psd and .dds textures can be either of an 8 -bit or 16 -bit precision. Ctrl+Left mouse button/Double click — select a surface or deselect a previously selected surface. Hold Shift to select/deselect more surfaces. Ctrl+O — load a mesh. Ctrl+S — save a mesh. Ctrl+R — reload all files. T — toggle base grid, surface triangles or a wireframe. F — focus on the selected surface. It sets the pivot on the focused surface. To reset it, use G hotkey. Space — deselect the selected surface. F1 — show the help window.